Can anyone identify the attached mystery signal? I've personally observed it only in the 11 meter citizen's band, though that doesn't mean I'm saying it never happens elsewhere. I often see it between 27.0 - 27.3 MHz, and only when skip/propagation is in. It has been happening for decades (earliest memory: late 1980s). It can be received with tuners in both Europe and North America (and possibly other locations). 1) Instead of a sinewave (like an ionosonde), it consists of a "warbly" up-down-up-down sweep tone. 2) That warbling tone itself descends in frequency (rather than ascending, as normal chipsounders do). 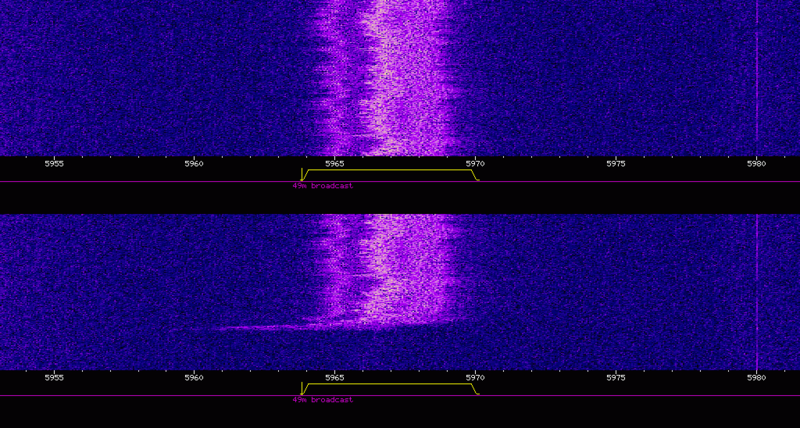 3) And it only descends 40-50 kHz. I.e., it begins instantly (no fade-in), descends 40-50 kHz, then stops instantly (no fade out). Here are several audio samples of it, edited together. 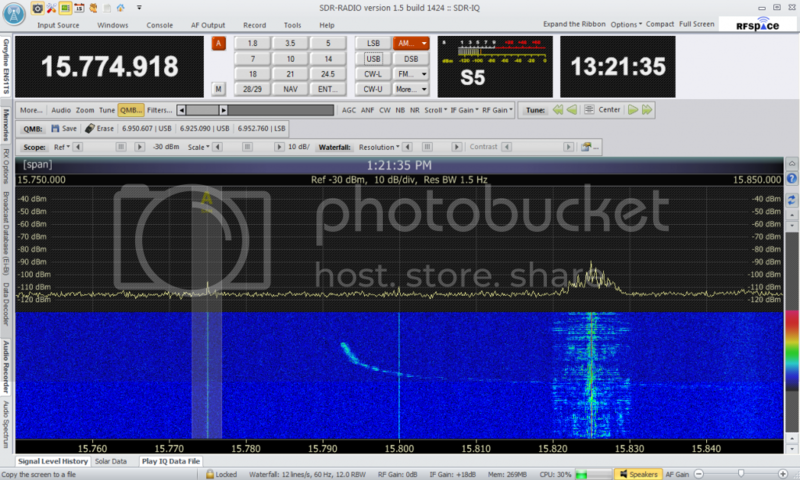 Note that I used Twente's WebSDR in DSB reception mode. That allows it to be heard as it sounds when crossing through AM carriers. Variation 1: Same as pictured above. While observing it yesterday, it always lasted 4 seconds, and then reoccured every 13 seconds. With this variation, the rate of frequency descent slows just before the signal vanishes (i.e., you see a diagonal line slowly curve into a vertical line). Sometimes, the signal even reverses direction (goes back up in frequency) just before vanishing. Variation 2: This variation always lasts about 15 seconds (i.e., it descends in frequency much more slowly). Unlike the first variation, its rate of descent does not slow before the signal vanishes, nor does it reverse direction and go back up. Therefore it always appears as a diagonal line on waterfalls. This variation also has a longer duration between occurences (30 to 60 seconds, guessing). Nonetheless, it sounds audible exactly the same as the first variation when it passes through your receiver's IF (same warbling sweep effect). I've heard that since the 1970's on the CB bands. 27MHz contains the most used ISM band in the world and it could be anything from dielectric heating to laboratory RF pumps. In the beginning of the recording, it sounds like my old APC UPS on 15 MHz (until I pulled it out of service on Tues as got sick of that). However, the later noises don't sound like it. Like cmradio said, could be just about anything. Your post reminded me of this screen cap I took last May 22 at 2200 utc. While I have noticed a few of these from time to time - May 22nd I was "seeing" remarkable clusters of the same. They persisted for about a 1/2 hour then were gone?? I seem to remember there were some rather energetic sun spots at the time?? Just guessing? The horizontal lines were from utility noise I was suffering last late winter into spring. Fascinating, Rockpicker. I'm also surprised that nobody really seems to know what causes these anomalies. Sure would be nice to figure out what this thing is! Some of those signals look like local RFI. I've seen similar things here when various electronic devices were switched on. Most today use switching power supplies, and the switching frequency is rarely stable, it drifts, often a lot, especially just after power on. And you get harmonics well up into the upper end of HF. I was testing an antenna this AM, and I began to note something very much like this. The entire duration of the period I noted this was only about 5 minutes. Spacing between the events was variable 30 to 40 seconds, and the termination frequencies tightly scattered around 15798 +/- 8 kHz. It went off (or stopped) before I could examine the top end of the slide. Again testing an antenna, I noted carrier coming and going on 15475 (LRA36?) 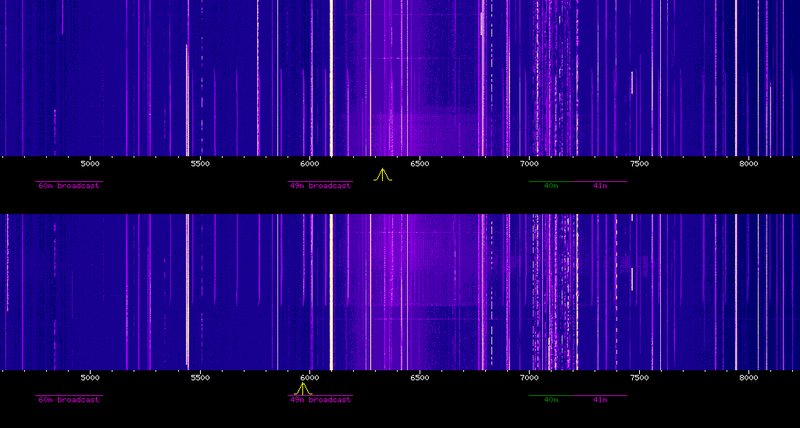 and checked the Twente SDR for comparison (also weak carrier there). I noted these hooks weakly on the Twente rig with terminal frequencies around 15490 kHz for a few minutes around 1900z. They were not noted here in Chicago. My old cell phone charger used to do a rhythmic warbling thing lasting 5-10 seconds per cycle until it was charged. Sounded somewhat similar to the file in the first post. Radio had to be less than 10 feet away tho. Yeah, a power supply or charger always a suspect. Test antenna was about 30 feet from the house. Hooks also seen at same time on a Wellbrook about 100 feet away from any home. Dunno, but interesting. Ive been hearing that same thing for years ive got no idea what it is though.Theres also one usually above cb 1-40 youll here beep beep beep brawwwwwwwwww lasts about three seconds then gone,have no idea what is either. If it's on 27.255, that's an ancient Radio Shack alarm. Local fella had it on his boat, didn't even know it (bought it second hand). Made a racket for years! hehe no its not on 27.255 it moves around i hear it off and on no matter where im at. I have heard this since the late 1960's and I have no idea at to what it is but I have parked a receiver on a 'clear' frequency and used this sound to let me know of band openings in this area of frequencies.